In both cases this covers the cost of growing the saplings in our nursery, planting and follow up maintenance for three years. Over the last decade and a half we have replanted more than 415 hectares of forest – that’s equal to about 775 football fields. But there are many, many more sites that need reforestation right now. We will give you the Google coordinates of your site, and send you annual updates of planting activity and tree survival rates. Email us at info@fnpf.org if you would like to help. 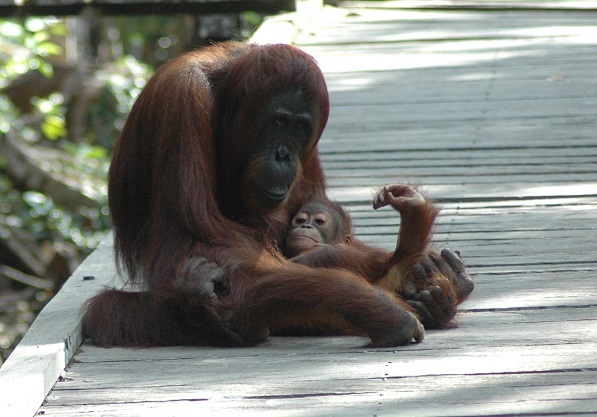 Orangutans in Kalimantan, on the island of Borneo, are a critically endangered species. Support us to restore native forest habitat in Kalimantan’s Tanjung Puting National Park and Lamandau River Wildlife Reserve, home to some the last remaining protected sites containing large orangutan populations. Within these protected areas orangutans can live in safety without fear of being killed as pests. Please help us to help the orangutans of Borneo survive. However, vast areas of forest in the national park and the reserve have disappeared, through farming, logging, mining, and forest fires. Approximately 65% of Tanjung Puting and 50% of Lamandau is severely degraded or cleared of forest. We are actively working to reforest these areas. Usually we select a site for reforestation that is adjacent to existing forest. Our objective is often to create “corridors” to connect existing patches of forests to one another. Corridors enable orangutan and other wildlife to travel from one area to another in safety and with access to food. Our approach to reforestation in Kalimantan has been developed over many years, dating back to 1998 when we first started work in Tanjung Puting . 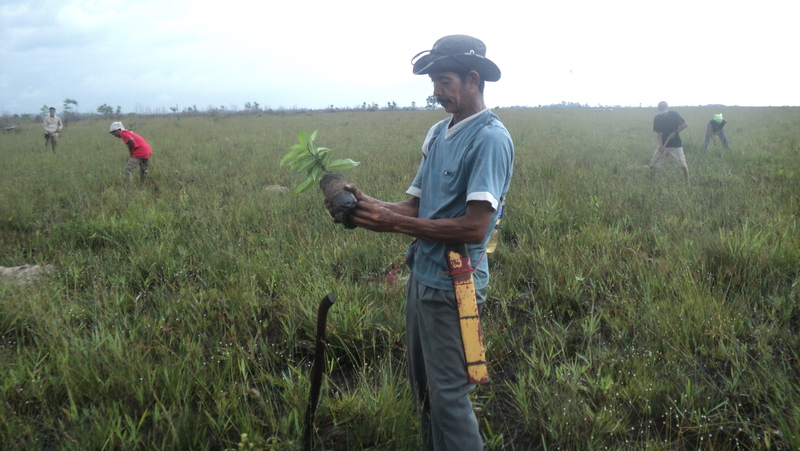 Each reforestation project is planned over a three year time line. In year one we create a nursery close to the reforestation site, grow thousands of native saplings, and prepare the planting site. At the end of year one or the start of year two we plant the saplings. Planting is done in the dry season, because in the wet season the water level is often too high for planting or for the saplings to survive. After three years the saplings are tall and strong enough to survive without regular maintenance. Our approach results in a sapling survival rate after three years of more than 70%. After this we continue to plant more saplings on a more ad hoc basis, replacing those that die, and to increase the diversity of species. We plant at least 400 saplings per hectare, but depending on resources – the funds we have to employ local staff – we try to plant more than 2,000 per hectare. Our saplings are grown from seed, seedlings and cuttings collected from the native forest. We have also had significant success using grafting. As part of the project we employ people from the nearby villages to help us. In doing so, we also get the chance deliver our conservation education program to the communities, through events like community planting days and conservation camps for local children.